I needed to use a Rapid Rewards ticket on Southwest Airlines before it expired, so I chose a place where I had not been to spend a couple of days. Of course, it also had to be where Southwest flew. The place I chose was New Mexico -- specifically Albuquerque and Santa Fe. There are many other places in New Mexico I would like to visit, but this was a very nice two-day trip. 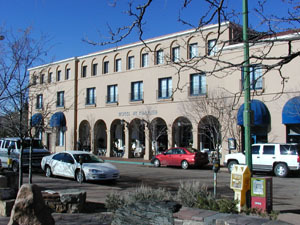 I flew into Albuquerque and spent the night, then drove up to spend the morning in Santa Fe. It's a very interesting town with some very historical places. They say they are the oldest capitol city in the United States, dating back into the 1600s and probably even earlier -- some excavations date to the 1300s. To the right is the Hotel St. Francis where I started the day off with a walking tour of the city. That hotel has a long history. It was built as a place where eastern tourists would feel at home, but with an exterior that fit the architecture of the area. This style is called "Territorial" -- there is a row of bricks along the tops of the walls. 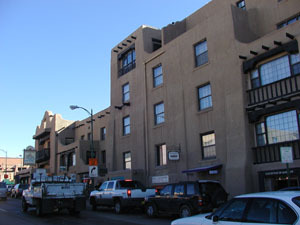 The La Fonda Hotel shows the other main style of architecture of the city called "Pueblo Revival." The smooth adobe-looking walls with the ends of logs sticking out denotes this style. 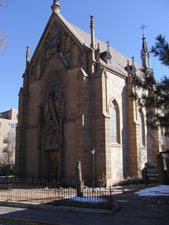 The San Miguel Church is the oldest church structure in the United States built approximately 1610, however some excavations under the main building date back to the early 1300s. 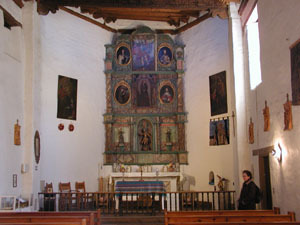 Below on the left is the inside (altar area) of the church; to the right, the church which was cast in 1356. 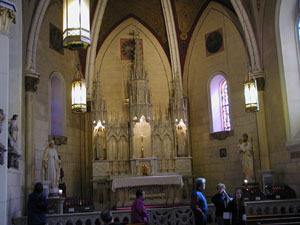 Next is the Loretto Chapel, home of the "miraculous staircase" (below, to the left; altar area below to the right). 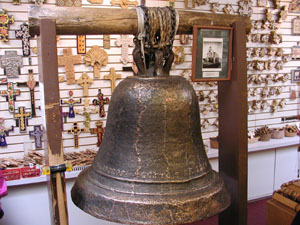 The building was originally constructed for the use of an order of men and boys. To get to the choir loft, they used a ladder. Later the building was given to some nuns. 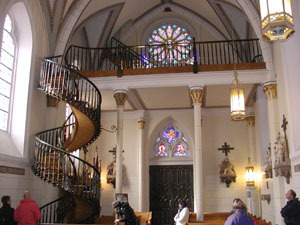 Using a ladder to climb to the choir loft was not appropriate so they wanted a staircase. Builders told them that a staircase would take up much of the inside of the building. Legend goes that the nuns prayed for nine days and nights about the situation. At the end of that time an old man showed up and said he was there to build their staircase. After six months, he was finished and the result was a circular staircase with no middle pole. 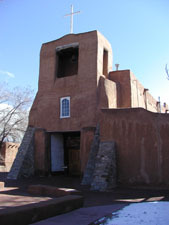 I finished my time in Santa Fe with lunch at Tomasita's -- very nice!